New legislation being proposed in California would begin to phase out the keeping of killer whales (Orcinus orca) in captive environments in the state. Democratic Assemblymember Richard Bloom of the state's fiftieth district announced the bill this morning at a press conference on the Santa Monica Pier. The bill, AB 2140, is informally called the "California Captive Orca Welfare and Safety Act." If passed, the bill would end performance-based entertainment for all killer whales in California, end captive breeding programs for the species within the state, prevent the import and export of genetic materials for breeding programs elsewhere, prevent the import and export of the whales themselves, and more. With the Pacific Ocean as his backdrop, Bloom began the announcement by describing the ways in which our relationship with one of the ocean's top predators has changed in the last forty years. "Not that long ago, the military used orcas for target practice because they were considered dangerous to humans or pests to fisherman, and were therefore deemed expendable. Well, things have obviously changed. Beginning in the 1970s, studies of these majestic creatures in the wild began to emerge, and over the next few decades we learned that orcas are neither mindless killers nor pests. In their natural habitat, orcas are docile, if not inquisitive." He went on to describe their social structure and cognitive sophistication: "Orcas are family-oriented, highly adaptable, [and] socially complex, with cultural traditions that trail only humans as the most intelligent creatures on the planet." While Bloom has a track record of concern for the environment – he is a former California Coastal Commissioner and former Chair of the Santa Monica Bay Restoration Commission – he explained that it was his constituents and his staff who encouraged him to consider developing legislation on orca welfare. The film Blackfish was what initially sparked the interest, but Bloom also consulted with marine mammal researchers, including the Animal Welfare Institute's Naomi Rose, rather than relying entirely on the film to form his opinions. "[Blackfish] is helping to form peoples' opinions, but…that wasn't enough for me. I went out and spoke to the scientific community," Bloom said. "It wasn't until after I had gathered all of that information that I became convinced that this was an appropriate bill to carry." While the legislation is designed to end the keeping of killer whales for entertainment purposes, the Assemblymember was clear that this was not targeted at SeaWorld per se. "This bill is not about SeaWorld and it is not intended to try and somehow harm SeaWorld and its business model." He said. "I am confident that SeaWorld can carry on without this one element of the many things that it does. SeaWorld does good work in the community. It provides funding for scientific studies, and it does marine rescue work that is highly thought of by the community." Importantly, the proposed legislation also acknowledges the practical and scientific limitations involved in the release of captive-born animals. "Another misunderstanding about this bill is that it would somehow lead to the release of all the orcas that are currently in captivity, into the wild," he said. Because killer whale society is so complex, it would be a poor welfare decision to dump these animals back into the sea. "To simply release them into the wild would probably be releasing them to their deaths," Bloom correctly explained. Those whales for which wild release would be impossible are instead to be transferred to sea pens. 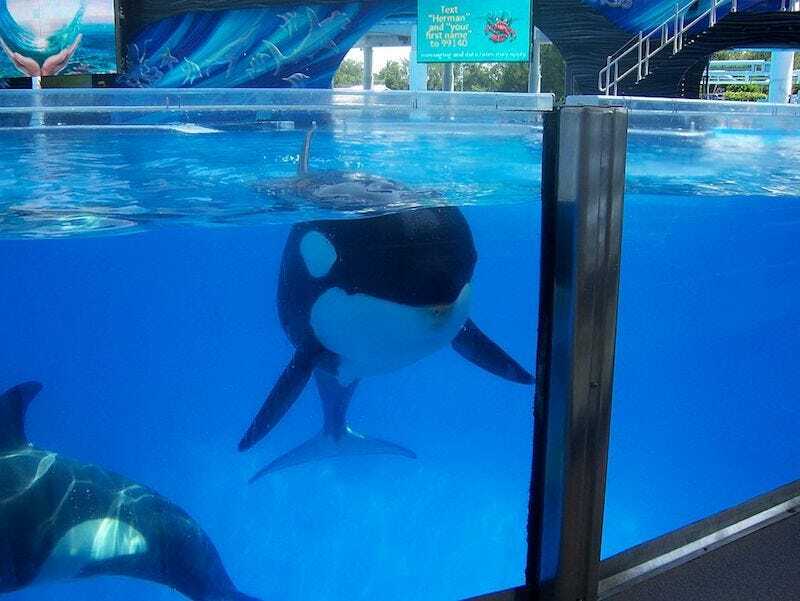 Until sea pens, which are large enclosures anchored to the seafloor and attached to the shore, become available, the orcas are allowed to be kept in their existing enclosures, but not for performance or entertainment purposes. That means that the orcas currently in marine parks and aquariums, some of whom will live out their lives in their enclosures, will still be properly cared for. The training that is necessary for veterinary care, psychological and physical enrichment, and management will still be permitted. The bill makes it illegal to hold in captivity a wild-caught or captive-born orca for "performance or entertainment purposes." That is defined as "any routinely scheduled public exhibition that is characterized by music or other sound effects, choreographed display or training for that display, or unprotected contact between humans and orcas. Holding of an orca is not, by itself, a performance or entertainment purpose." The bill also makes it illegal to import or export killer whales intended for performance or entertainment. It explicitly states that this provision would be waived for transferring an orca to a sea pen or to the wild, and doesn't apply to individuals who are "held for rehabilitation after a rescue or stranding, or for research purposes." The legislation, as written, would also end the participation of captive orcas in California in breeding programs. It would be illegal to breed or impregnate any of those orcas, and it would also be illegal to "export, collect, or import" any genetic materials from those whales "for the purpose of artificial insemination." Ostensibly this would mean that researchers could still collect genetic materials for research purposes. California is currently home to ten orcas held in marine parks or aquaria. Three of them were captured in the wild before it was made illegal, and seven were born in captivity. At the end of the press conference, as if on cue, a bottlenose dolphin breached the surface of Santa Monica Bay, several hundred meters behind Assemblymember Bloom. It served as a good reminder that with a little patience and luck, it's even possible to witness a performance from a wild cetacean.